IDIL Fibres Optiques proposes a wide range of tailor-made optical bundles, namely assemblies of multiple optical fibers. 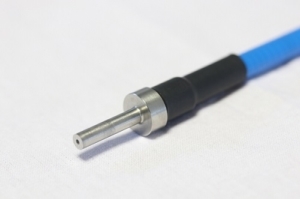 IDIL Fibres Optiques provides custom fiber optic bundles in accordance with customer’s requirements: fiber types, materials and diameters, quantities (from small batch to several hundred), connectors types, customized ferrules, wavelength, numerical apertures, etc. Our engineering flexibility also concerns mechanics and assembling. Actually, Fibers assembling process can be realized without glue which enables to resist a very high power laser (> 1 watt). 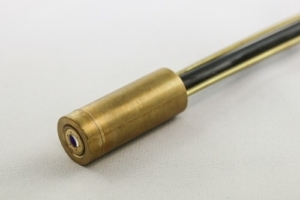 Otherwise, specific lenses can be put in front of such assemblies. IDIL Fibres Optiques also produces multi-branch assemblies where fibers are held together on the one end and divided into several branches on the other hand. 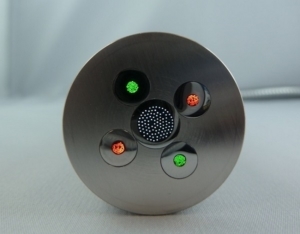 Positioning of each optical fiber within branches can be precisely determined and implemented in order to meet the required distribution at the end. 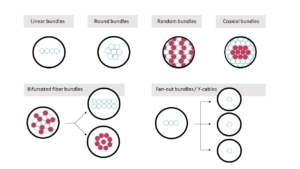 A fiber bundle is the assembly of multiple optical fibers. The fibers of the bundle are usually held together at one end, and may be separated into multiple branches at the other end. Fiber bundles provide significantly more light throughout compared to a single optical fiber in a patchcord. They also offer greater physical flexibility and high precision.